KEEP READING FOR A GREAT SCENTSY GIVEAWAY! There is so much to be thankful for, it really is hard to decide what will make these next few posts... but today is an ode to my husband. If there is one thing he loves, it's great smells. Although great smells come from great cooking, they also come from great candles. 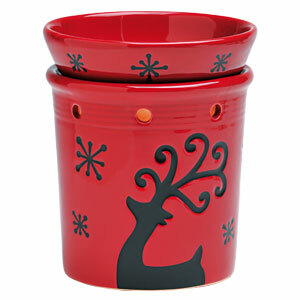 Now with kids around candles can feel a little risky, but then came Scentsy. This is a "flameless" candle which is actually kind of a throw back to the scented wax warmers that used a candle. No candles here, just plug in the warmer and the small light bulb does all the work. I'm a fan of the nightlight sized warmers, but the larger Scentsy warmers are quite lovely. But now we need to talk about fragrance! Silver Bells is the fragrance of the month (also 10% off) and this scent is described as "Icy peppermint candy canes dance over warm and welcoming winter pear and crisp apple, all enveloped in a velvety blanket of caramel and vanilla sugar" - WOW! Whether you are ready to make your home smell great or give the gift of great scents this holiday season, Scentsy has it all! Leave a comment including your email address for a chance to win a Holiday Plug In Warmer and the scent of the month: Silver Bells. This is so great~ Thanks for the info Jenna! I love the entire holiday collection this year! I LOVE Scentsy! I'll have to try Silver Bells, as I was planning on ordering a couple of gifts. I just switched my Scentsy to Cranberry Spice this evening. I also recommend that scent.